Over the years we have created many, many cottage signs as Christmas gifts. Custom Wood signs from The Sign Depot are made from western red cedar, known for being rot-resistant and durable in all outdoor weather conditions. Pairing that with our custom paint finishes for signs, our Traditional Wood Signs Are Personalized To Suit You! Plus you have an abundance of choice when it comes to creating a custom wood cottage sign. Our sandblasted and carved signs provide you with an artistic sign that is sure to be appreciated as a gift this Christmas. Here is a sample of this year’s custom sandblasted cedar sign projects. Your carved cedar sign should last forever – at least out last you. Resin in western red cedar is naturally very rot resistant. But, your sign can become dull looking from a build-up of grime and dirt. Simply wash with warm soapy water to remove dirt and top coat with spray on car wax for a clear protective water repelling finish. * Do not use high pressure washer to clean your sign as this will damage wood and finish. We hope the above examples give you some gift giving ideas. As you can see there is no limit to the type of sign we can make. You pick the size, shape, text, graphics and colours to give your cedar cottage sign a personalized engraved look. To see more wooden signs that we have made, take a look at the portfolio page on The Sign Depot website. Is there someone on your list that would appreciate a Custom Wood Cottage Sign At Christmas? If so, make sure to visit our contact us page and start arranging your custom cedar sign. Moving due to an expired lease, we have taken the opportunity to reassess Sign Depot. Where do we want to be? What kind of company do we want to be? How do we want to service our customers going forward? What do we want to look like within the sign market and to our customers? belly-button gazing exercise. We will continue to redefinte who we are and what we do. Over the past month we have slowly and steadily moved into our new crib. Directly across from the old location we are still located at the corner of Borden and Charles but now south…about 200 ft. The heritage space we choose to work in influences the custom work we produce. We look for, and create work spaces that inspire us, have a story, and inevitably say something about us. We have chosen Kitchener’s historic Doon Twines building as our next shop/studio. A grand factory from the early 1900’s that wears the history of it’s workers like smile wrinkles of a experienced traveller. Boot polished hardwood floors, sturdy steel rivet I-beams, soring steel truss vaulted ceilings and sky-lite work area’s. This building has a straight forward honesty, it’s structure is not hidden, beams and braces are exposed and understood. Artistic sign design shares these structural attributes. Good design makes sense with a clear message and materials reflecting the business and suggesting a story you want to know more about. We look forward to working within Doon Twines to create some of our best work. We thought it would be a good idea to capture some behind the scenes photos from our new space to serve as memento of this chapter here at The Sign Depot. One day we can look back and see how we evolved within this re-purposed factory. I know that some are superstitious about this day and others make their way to Port Dover, but this Friday the 13th in Kitchener-Waterloo (Waterloo Region for the out of towners) is Random Act of Kindness Day! A day where you do-good for others and create some smiles wherever you are headed today. I’m headed into The Sign Depot office, so that means my lucky co-workers are getting donuts from me! Shhhh don’t tell, I haven’t arrived yet. Did You Show A Sign Of Kindness Today? What are you doing for Random Act of Kindness Day? Make sure you show signs of kindness to those around you. It doesn’t take much effort and it can make a big difference in someone’s day. To learn more about visit the Random Act Of Kindness Day website. 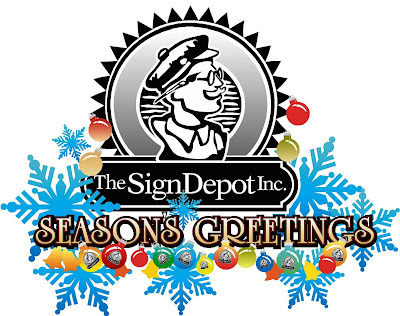 Community Involvement is a priority at The Sign Depot, and we hope other businesses and individuals understand how important kindess and caring is to a keep a community thriving . Finding ways to add kindness initiatives in companies, schools, community centres and so many more local establishments is the best way to keep the friendly local spirit alive where you live. Let us know what you are doing to get your workplace involved in your local community. They say smiling is contagious. It can lead to other great things like volunteering, charity and a feeling of accomplishment. Make sure you show you signs of kindness to everyone you meet today and hopefully you want to carry it on throughout the whole year. Who knows what a little kindness can spark, or in my case what a dozen Tim Horton donuts will bring? Restaurants are always looking for unique ways to add decor elements to their interiors. Finding ways to enhance a restaurant’s interior with artistic sign designs that compliment the establishment’s atmosphere is one of the many signs solutions we offer to our clients. When The Charcoal Group brought us the concept behind Wildcraft Grill And Bar we knew they wanted sofisticated signs for interior that complimented their exterior business signs. Choosing to create a display stand showcasing their extensive wine bar was a way to add a wayfinding sign that fit the surrounding decor. 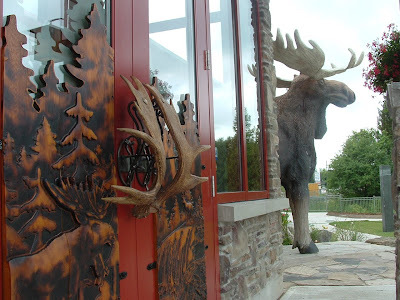 Wildcraft Grill And Bar was well received by Waterloo Region. It continues to be a thriving restaurant where people enjoy the atmosphere just as much as the menu. By adding a few artistic sign displays, this establishment keeps their customer well informed of what to expect and where they should be headed next, to fully experience all their restaurant has to offer. Will it compliment the surroundings? These are key elements to creating sign displays. You want to highlight certain aspects of your businesses without taking away from the look and feel of your interior design. For more information on how The Sign Depot can help you with your restaurant sign solutions make sure to talk to one of our sign design experts. They will be happy to answer all of your questions about Restaurant Signs and how they impact the Food Service Industry. Knowing what will look great in your restaurant is just the beginning of the professional sign services we have to offer. What makes The Sign Depot unique from many other signs shops is our ability to create 3 dimensional signs. Many think of these pieces as artistic sculptures, but our clients know that these signs serve a purpose. Below are you can see examples of 3 dimensional signs for businesses. 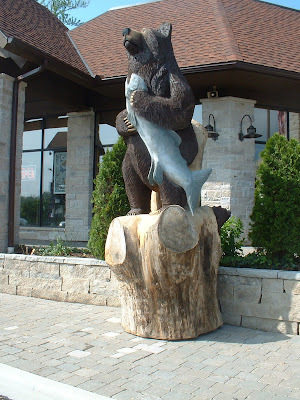 The chainsaw sculpture was created as a landmark sign for Souvenir City in Niagara Falls Ontario. This kind of sign is known to grab the attention of passers-by making your business memorable to potential customers. Finding original ways to advertise your business through custom signs is something The Sign Depot is well known for. We have won several sign industry awards for our 3 dimensional signs and structures. Being at the top of your industry is an honour for any company and it is why we continue to create artistic signs that we can be proud of. You should always strive to be the best, and standing out from your competition is the great way to be at the top of your industry. 3 dimensional signs do just that. They stand out and get your business noticed. Whether you chooose a chainsaw sculpture or High Density Urethane Sign Props your company will recognized right away. These signs make an impact and you want the first impression of your business to be a memorable one. A custom business sign is a 24 hour advertisement for your business so be sure it reflects your company and what you want it to be known for. This how you elevate your game and rise to the top of your industry. To learn more about dimensional signs be sure to visit our dimensional sign gallery, then be sure to contact our dimesional sign fabricators to see how sign sculptures can work for your business. Last week we were displaying are Carved Wooden Signs at the Consac Imagemakers Show. This is a well known Canadian Sign industry trade show hosted by The Sign Association Of Canada (of which we are members). Being an award winning Canadian sign company we do our best to show our wholesale wood sign offerings to others in the sign industry. Many would see others in their industry as competitors, but we see them as potential clients. Most sign shops are constantly looking for new ways to add revenue streams to their business. By offering custom wood signs to their clients they are able to do just that. When we talk about wholesale wood signs, many think that they come in a standard size and finish. This is not the case. Cedar signs are easily customized to suit each business. We give sign companies lots of choice when it comes to size, shape, text and graphics. Additionally there are options when it comes to the final sign project. 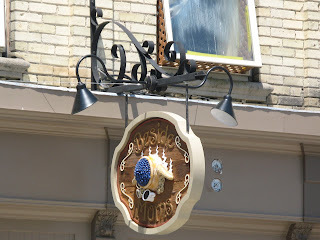 It can arrive as an unfinished piece or a fully painted sign complete with outdoor finish and optional gold leaf guilding. All of these options are available in both single sided and double sided sandblasted signs. We can provide lots of options designed to fit your budget. By providing us with the information listed above, the wholesale sign experts here at The Sign Depot will be able to estimate the cost of creating your cedar sign and will contact you regarding your wholesale quote. Manufacting custom business signs for the restaurant industry gives the expert sign makers at The Sign Depot the opportunity create artistic signs with several different sign materials and sign finishing techniques. When it came time to create this outdoor lit sign we knew that a Carved High Desnsity Urethane (HDU) sign would be the best choice for this locale. HDU is our material of choice when it comes to 3 dimensional signs. It is a very versitile material which gives us lots of options for designing signs. After the HDU has been carved on our CNC router, it is then layered to add dimension and finished to add durablity and visibility. The three colour palette of matte black, matte white and 23kt gold leaf guilding was selected to keep the sign clear and easily noticed in this high traffic area. By adding a lit sign option to this sign package The Charcoal Steakhouse’s roadside sign serves as a 24 hour advertisement for the restaurant. This carved high density urethane roadside side is complimentary to The Charcoal Steakhouse’s surroundings while bringing extra attention to their well know establishment. The look is warm and inviting. This HDU sign will grab the attention of passers-by and encourage new customers to come and dine at the restaurant. When it comes to Carved High Density Urethane signs, be sure to contact the sign professionals at The Sign Depot. 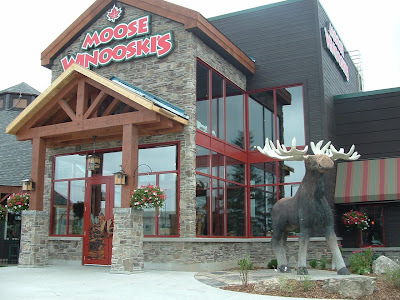 They can offer signs solutions for everything from Restaurant To Retail signs. To see more examples of our custom business sign solutions, take a look at our portfolio page on The Sign Depot website. Be sure to let us know what caught your eye! Leave us a comment, send us a tweet or post on our facebook page. We always look forward to hearing your comments. Sign people are always telling potential customers “ Business signs are one of the most obvious places to demonstrate a first impression ” Of course this is true but there are other opportunities to affirm this first impression – like the front door. 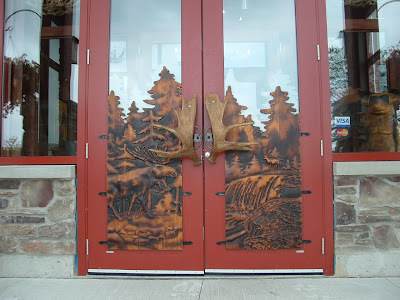 Every customer goes through the front door of this restaurant,what a great opportunity to make an impression. ” cetol ” to preserve and bring out the warmth of the wood. Details like custom hammered iron brackets compliment the carved wood and add to the handmade feel. 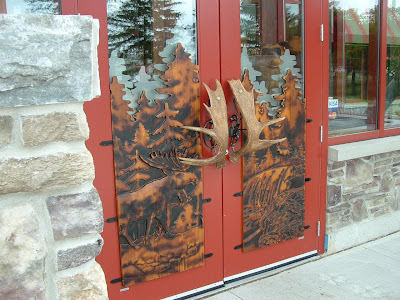 Custom made moose antler door pulls are memorable and a fun addition to the restaurant. First impressions are not restricted just to the sign – be creative and find a new way to impress your potential customers. We often reccomend 3 dimensional signs to our clients. 3 dimentsional signs make an immediate impact. Their purpose is to be unique and memorable. This sculptural door sign is a great choice as it reflects the restaurant concept and gives customers a glimpse of what to expect once they open the door. Do you have an area of your business that could use a little WOW power? Make sure to contact our sign design professionals and see what we can create for your business. It’s easy to stand out. 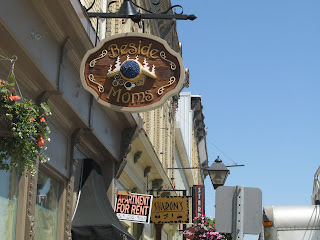 One recently completed project is ” Beside Moms ” a nice little cafe located in Nairn, Ontario. It always surprises me how the extra effort of carved dimension brings a sign to life. For this project we simp ly carved a bowl full of blueberries – coffee cup – muffins and cookies. This 3 dimensional sign was projected off the building making it visible to vehicle and pedestrian traffic. This sign serves as a unique landmark for this area of town, making it easy find and memorable to people visiting the area. The mix of sandblasted western red cedar and cnc routered high density urethane gives this sign mutiple layers of dimension. Adding a pop of colour to the painted sign finish creates another focal point on the sign. The sign bracket, hanging hardware and goose-neck sign lamps are finished it black to give the projection elements of the sign an uniform look. This lets the sign stand out from the surroundings and lit sign can serve as a 24 hour advertisement for this establishment. This small cafe wanted a small sign. The idea was to make a big impact in a small area. Choosing a 3 dimensional sign gave this small carved sign a lot of impact and created a lot of buzz for the business opening. Finding a way to stand out from your surroundings is great way to attract new customers and get them in the front door. That is how you properly use your custom business signs to advertise your business. Let your store front sign show what potential customers can come to expect from your business. First impressions are lasting impressions. This double sided carved cedar sign is a classy way-finding business marker. Each tenant has their own carved panel allowing the landlord flexibility to update in the event of tenant turnover. This carved cedar sign features rich coffee brown latex along with both gold and silver leaf guilding. Being that this custom business sign was fabricated from western red cedar, this sign will give longlasting landmark for their business. Sandblasted Cedar is one of the best choices for an outdoor sign because it is rot-resistant and very durable no matter the weather conditions. Adding a durable sign finish adds a protective coating for the wood and adds some additional flare to the sign. Because the sign was custom made it features a carved panel that can allow the landlord flexibility when it comes to updating the tenant listings. Finding unique sign solutions for business owners is something we specialize in here at The Sign Depot. Offering options that meet a client’s needs and budget are just some of the ways we have become an award winning sign company. We understand how important a great looking sign can impact a business. We take the time to listen to our clients and give them ideas of what would best compliment their company. Here at The Sign Depot we work to exceed our clients’ expectation and have an extensive list of repeat customers who gracious enough to refer us to their contacts. That type of word of mouth advertising is something we are very proud of here at Sign Depot and we look forward to hearing how we can help your business shine.